IN A DEPRESSING case of irony by juxtaposition, the death of climate change legislation in the Senate has been followed by the appearance of two government reports in the past week that underscore the overwhelming scientific case for global warming -- and go out of the way to repudiate skeptics. 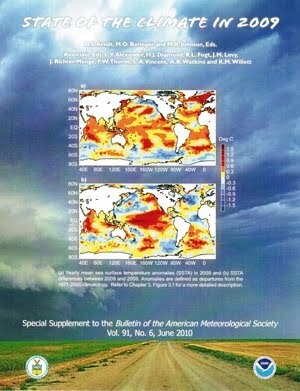 First came a report on global climate from the National Oceanic and Atmospheric Administration, which confirmed that the 2000s were by far the warmest decade in the instrumental record -- as were, in their turns, the 1980s and the 1990s. Unlike year-to-year fluctuations, these 10-year shifts are statistically significant. Further, the report notes that it derived its conclusions from an array of data sources -- not just the land-surface readings that doubters challenge -- from ocean heat uptake to melting land ice to sea level rise. "If the land surface records were systematically flawed and the globe had not really warmed, then it would be almost impossible to explain the concurrent changes in this wide range of indicators produced by many independent groups," the report said. "The warming of the climate system is unequivocal." The gases most likely responsible for that warming, such as carbon dioxide, continue to accumulate. Second was a strongly worded response from the Environmental Protection Agency to petitions that it revoke its finding that "climate change is real, is occurring due to emissions of greenhouse gases from human activities and threatens human health and environment." As with much climate-change skepticism, the petitions were based "on selectively edited, out-of-context data and a manufactured controversy," EPA Administrator Lisa P. Jackson said. Among other things, the agency reviewed every document from the "Climategate" e-mail hack at a respected British climate research unit. The EPA found what four other independent studies did: that the e-mails contained some "candid" language but nothing that seriously discredits the scientific consensus on global warming. Perhaps it is still too much to hope that Virginia Attorney General Ken Cuccinelli II will call off his misguided investigation of climate scientist Michael Mann, which seems to be based on the e-mail affair. Many climate-change skeptics will simply dismiss these reports as more evidence of a sprawling conspiracy instead of what they really are: yet more affirmation of the risks humanity runs if it continues to pump carbon into the atmosphere. EPA determined in December 2009 that climate change caused by emissions of greenhouse gases threatens the public's health and the environment. Since then, EPA received ten petitions challenging this determination. On July 29, 2010, EPA denied these petitions. The petitions to reconsider EPA's "Endangerment Finding" claimed that climate science can't be trusted, and asserted a conspiracy that calls into question the findings of the Intergovernmental Panel on Climate Change (IPCC) Exit EPA disclaimer, the U.S. National Academy of Sciences Exit EPA disclaimer, and the U.S. Global Change Research Program. After months of serious consideration of the petitions and of the state of climate change science, EPA found no evidence to support these claims. The scientific evidence supporting EPA's finding is robust, voluminous, and compelling. Climate change is happening now, and humans are contributing to it. Multiple lines of evidence show a global warming trend over the past 100 years. Beyond this, melting ice in the Arctic, melting glaciers around the world, increasing ocean temperatures, rising sea levels, altered precipitation patterns, and shifting patterns of ecosystems and wildlife habitats all confirm that our climate is changing.